This article was originally written in May, 2014. When the name Gabriel Landeskog is mentioned around NHL circles, there are a few words that are bound to pop up nearly every time. Leader is obvious, as the 21-year-old Colorado Avalanche forward has spent the past two seasons as the youngest captain in NHL history. Gritty is another, as his on-ice performance is often characterized by frequent puck battles and hard-hitting play. Landeskog could also be described as talented, which can be supported by his 134 points through his first 199 regular season games. Yet it’s often ignored, forgotten, or simply unknown by many that Landeskog is really unlike any Swedish hockey player to come before him. Perhaps it’s time ‘pioneer’ is the word of choice used to describe the young Avalanche star. While Landeskog’s no Jackie Robinson (or perhaps former Boston Bruin Willie O’ Ree would be a hockey comparable), there’s a testament to be made for any sort of athletic innovator. In many ways, the native of Stockholm has the potential to be as important and intriguing piece of hockey history as nearly any individual whose presence extends beyond their statistical measures. In a video highlighting his junior hockey years with the Ontario Hockey League’s Kitchener Rangers, Landeskog’s teammates joke around about how he’s getting better grades than any of the native Canadian players, despite having English as his second language. Grasping language is the first and foremost crucial part of adapting to a culture, and Landeskog’s fluency in English is apparent in both a retrospective look at his junior years and today. It doesn’t take a Rhodes Scholar to recognize the player’s comfort level and ability to fit in quickly with his new surroundings, something he would later do in Colorado, winning the Calder Trophy as the NHL’s top rookie in his first season. Another notable point mentioned in the video is physical play, which is one of the first things anyone notices about Landeskog while watching him on the ice. Other available clips of his junior career (see here) are just further evidence of Landeskog’s intriguing playing style and personality. While Swedish stars of generations past such as Peter Forsberg and Mats Sundin were known for their big body presence, it was more of an asset than a defining part of their game. And while there’s no real Swedish or European mold to success, skilled play tends to be valued over physicality, although perhaps that’s becoming more of an outdated generalization than concrete fact. Ultimately, perhaps the real reason why Landeskog is most unlike Swedish hockey players of past generations is his bold move to the Canadian junior system, a rarity among top prospects from the Scandinavian hockey-mad country. 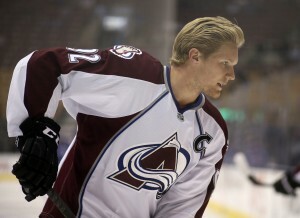 At #2 overall in the 2011 NHL Draft, Landeskog became the highest-ever Swede taken who played his junior career in the Canadian Hockey League. That’s not to say his development was independent of the renowned Swedish development system. 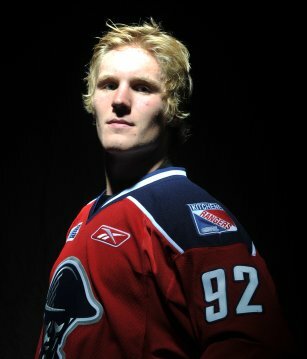 Landeskog played one season as a 15-year old with famed Swedish Hockey League club Djurgården prior to his immigration to Canada. 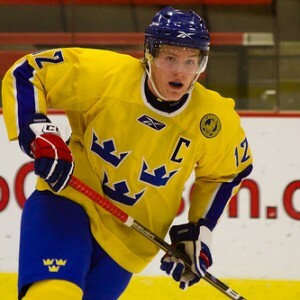 In addition, he was a key part on Team Sweden’s roster for multiple junior showcase tournaments such as the U-18 and U-20 World Championships, and he was a member of the silver medal-winning squad this past February at the Sochi Olympics. Yet despite his growth with his own national program, it was really his two years in the Ontario Hockey League where scouts really got to the opportunity to see Landeskog form into the dynamic player he is today. A mentor to Landeskog in his first days in North America, Kitchener Rangers Head Coach (and current head coach of the AHL’s Toronto Marlies), Steve Spott, noted in the above video that Landeskog’s leadership skills would make him a prime candidate to be an NHL captain, quite the praise for a junior hockey player. 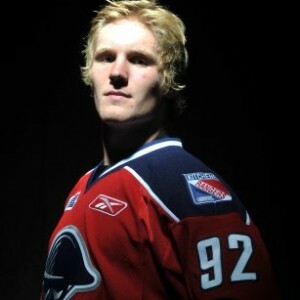 Landeskog’s junior days are a great reflection of both his current play and character. Spott’s bold prediction came true likely much sooner than anyone could have predicted, as Landeskog had a ‘C’ sewn on to his jersey prior to the commencement of the 2012-13 season, just his second in the league. While this was perhaps a surprise to many, Landeskog was one of the key reasons for Colorado’s re-emergence this season, so there isn’t any reason to regret burdening Landeskog with such a major responsibility at his age. A high ankle sprain injury suffered at the 2011 World U-20 Junior Championship could have derailed Landeskog’s drive or spirit to end the season, but Landeskog finished the year as strong as ever, amassing 10 points in a 7-game first round series loss to the Plymouth Whalers. Landeskog was earning praise throughout the draft process, including from writers at THW, the Denver Post, TSN’s Bob McKenzie & Producer Tim, and future teammate Matt Duchene, to name a few. Despite being captain and a very personable figure, there’s a definite case to be made that Landeskog’s not the biggest star on his team. Matt Duchene and Nathan MacKinnon tend to steal much of the spotlight for the Avalanche, yet Landeskog has (somewhat) quietly emerged as one of, if not the top, player from his 2011 draft class. Since Landeskog’s first career game until May 2014, no player who started in the NHL at the same time or later had amassed as many points. Success aside, it’s important to recognize that there are still a number of questions looming over the young player, as his pro career is comprised of just three seasons so far. Critics may wonder if Landeskog developed himself the ‘right’ way, or if he’d be better off if he had stayed to develop in Sweden. Others may wonder if he’ll serve as a role model for upcoming Swedish talent, showcasing the success one can have through the Canadian junior system. And of course, Landeskog will be held to the highest standard of performance due to the proof of his capabilities at the NHL level. How exactly his career will unfold and be remembered is up to the people and him to decide, but it’s likely a player with a blend of talent, skill, and leadership abilities would be able to succeed under any system, regardless of birthplace or where he trained. Landeskog’s still got more than a few years left to solidify his role as a premier leader and player within the NHL, and it’s yet to be seen exactly whether Landeskog will emerge as one of the league’s biggest European stars, or stay in his role as solid player, but not quite reach super-stardom status. 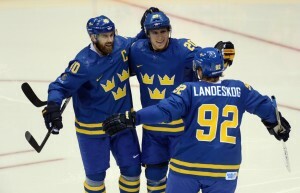 However, it’s likely Landeskog will be the only one of his breed for at least one more year, as none of the top Swedish prospects ranked by major scouting services played their junior hockey in North America. When you look at the whole of Gabriel Landeskog, it’s really tough to compare him to anyone else, simply because he’s so different than any other player to come before him (and so far, since). Applying one or two words about his intangible abilities is easy, but there’s so much more to the player and the person that can’t simply be summed up in just a few syllables. 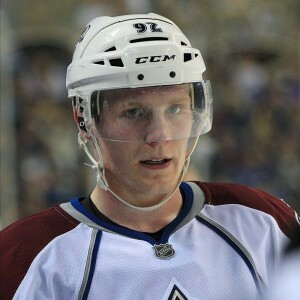 But whatever words you use to describe Landeskog, just don’t pass him off as a ‘typical Swede’.